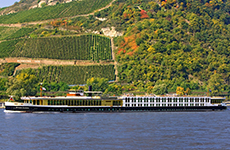 The River Queen is the most unique river cruise ship in Europe. Her exterior resembles the great steamships of the 1930's, while her plush interior provides a classical elegance reminiscent of the famous Art Deco style. As you are warmly welcomed onboard, the elegant lobby sets the stage for the unfolding of your one-of-a-kind river cruise experience. The beautiful main lounge boasts panoramic views and the only working fireplace on any river cruise ship. It's the perfect place to gather with friends for cocktails or to enjoy some culturally-enriching onboard entertainment.